Skencil can be extended by Python code in various ways, from user scripts to plugins. Skencil already comes with some plug-ins and example scripts, but there are some more available separately. Christof offers a number of Skencil plug-ins, like Graph, Transform Script, Ptui Shell and Turtle Library. His "Text Plugin" already made it into the mainline giving Skencil multiline capabilities since 0.6.13. Pieter offers plug-ins for brightness, contrast and color manipulation and an Skencil Object and Image Library (SOIL). Some of them are described in more detail below. Kajiyama has scripts like PathUtils, Calendar, Equal-area projection script, JapaneseText and PolygloText -- all with examples and screenshots. A bundle of useful plugin objects (arrow, cube, star, cylinder, ...), inspired by the autoshapes that other famous applications have. The objects are highly configurable by dragging the handles. By Christof Ecker. A script from Pieter Edelman to interactively set the brightness and contrast of selected objects. BuildImage by Terry Hancock is a build system for image resources. It attempts to do for image resources what make does for programs. BuildImage addresses the common case where the image resources are initially edited in a vector graphic program. This is interesting for Free Software Developers or Artist who want to get getting good image resources for programs ranging from games to web applications or just want to script the repetitive task of converting to bitmap for various uses. Makes it easy to create calendars in a variety of layouts. By KAJIYAMA Tamito. A script from Pieter Edelman to interactively blend the color of selected objects with a given color. A script to create Bezier-objects from font files. This is particularly interesting if you want to use an unusual font for e.g. titles or logos that is not yet installed for use with Skencil or that you only have as a TrueType font. This script is similar to the JapaneseText script below, but it works for both TrueType and Type1 font files and it builds the list of available fonts dynamically at run time. It borrows some code from JapaneseText and requires the FreeType bindings from JapaneseText. The current version is curvetext-1.0. Helps users to draw a certain kind of three-dimensional drawings in three-quarter view. The script comes with a step-by-step tutorial. By KAJIYAMA Tamito. Reimer Behrends has written a script to create fractal structures as they occur in nature, such as rivers and coastlines. A plug-in object and dialog that lets you import ArcView shapefiles into Skencil. The objects created with this extension retain some rudimentary information about their origin so that objects read from different shapefiles that used the same projection can be registered with each other. 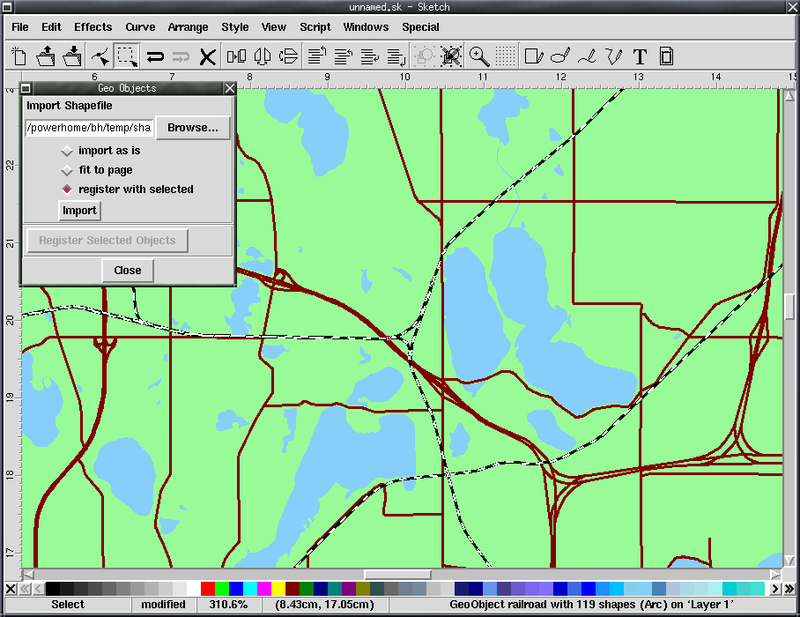 Screen-shot of a map created with this plug-in, using the MapServer demo data. The current version is geoobject-1.0. Create simple line and scatter graphs of one or more datasets with the GNU plotutils. This is a plugin-object written by Christof Ecker. A script by Tamito KAJIYAMA for drawing Japanese characters. The script reads outline data directly from Japanese TrueType fonts using the FreeType library, and generates Bezier curve objects that represent Japanese characters. In case the official home-page is not available, there is a local copy of version 1.0 as well. An experimental add-on script that makes it possible to draw multilingual text using the functions of the m17n library. Arabic, Hebrew, Hindi, Thai and Chinese are a few examples of the languages and scripts the m17n library supports. This add-on substantially extends the number of TrueType fonts that can be used in Skencil. By KAJIYAMA Tamito. Soren Henriksen has written two plugins to use LaTeX for typesetting in Skencil. One is a plugin object for text typeset with LaTeX. This one is different from Christian von Ferber's script in that it provides a new object type for LaTeX text and represents the typeset text as Skencil text-objects instead of EPS files. The other plugin is an export filter that writes an EPS and a tex so that the LaTeX plugin text is set in TeX and the graphics is in the EPS. 2002-04-03: The web-page is available again under a new address. 2002-03-30: The web-page is down. For the time being, you can get a tarball with a version of the plugins from January 2002. Create multiline text objects that can have multiple fonts and colors. This is a plugin-object written by Christof Ecker and comes with stable Skencil versions since 0.6.13. PathStroke by Simon Budig traces the outline of bezier path objects with a second path. This can be used to quickly draw a bezier shape and then vary the line thickness locally to get more "natural" effects. Right now the resulting path might intersect itself when the source path has very sharp curves, overlaps itself or has edge-anchors. However, the resulting path might be used as a starting point. A set of scripts implementing boolean operations on paths, written by Tamito Kajiyama. Supported path operations are: union, intersect, exclude, minus front, minus back, divide, trim, and outline. Script from Pieter Edelman implementing an object library. A plugin that enables the inclusion of LaTeX formulas, arrays, tables, lists and paragraphs in a Skencil document as a curved object. By Joel Biddier. This plugin allows to choose ICC-profiles, set render intents and create a softproof of the current Skencil drawing based on these ICC-profiles. So you can check how colour would like on an output device like a printer (soft proof) using colour management. For requirements (just ghostscript and Marti Marias littlecms), installation and usage see the header of softproof.py By Tobias Hilbricht. 2001-08-28: The TeX script now allows you to use both LaTeX and plain TeX and the formulas can be modified again later.